Imagine Chiropractic offers you a positive, lively environment in which to begin your healing. From the moment you enter you will be greeted with a smile and made to feel at home – you’ll see people of all ages, including plenty of children, at our office. We welcome your family to experience our natural approach to wellness! 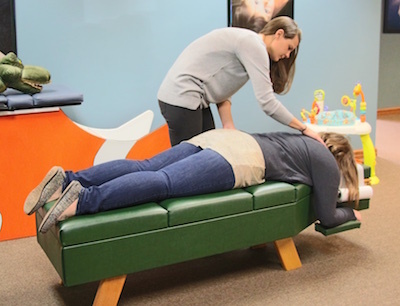 If your child is a new patient and may not be ready to see Dr. Jill or Dr. Carolyn right away, feel free to stop in as many times as you need for them to feel familiar with our office. The new patient process is tailored to each individual, and we are happy to accommodate you or your child’s needs. You can bring in your paperwork completed by downloading it from our website. Otherwise, these forms can be filled out upon your arrival at Imagine Chiropractic. Then, you’ll meet Dr. Jill or Dr. Carolyn and go to an examination room. We’ll go through your history and have scans taken with the Insight™ Subluxation Station. We’ll then perform all necessary tests to understand your needs and condition. Within 30 minutes, you’ll have received your first chiropractic adjustment and be checked out at the front desk. When you return, we’ll go over what we believe you need, how long it’ll take and what the cost will be. We want you to understand what’s happening in your body and what we feel we can do for you. You’ll get options so that you can decide what’s best for you and your child. At your regular appointments, you’ll be in and out in about five minutes. It’s a commonly held myth that once you go to the chiropractor, you have to continue going forever. We find that people choose to come back because they feel that chiropractic care gives incredible benefits to their lives. We don’t technically have to brush our teeth more than once a day, but we do it because we want to maintain a healthy smile. It’s always up to you to choose what you want to do, and we don’t require you to sign up for any long-term plans or prepay for your visits. On-site X-ray facilities are available at Imagine Chiropractic. Contact us today to find out what we can do for you!